End-over-end drum tumblers offer a accelerated method of mixing which is often superior to horizontal mixing. 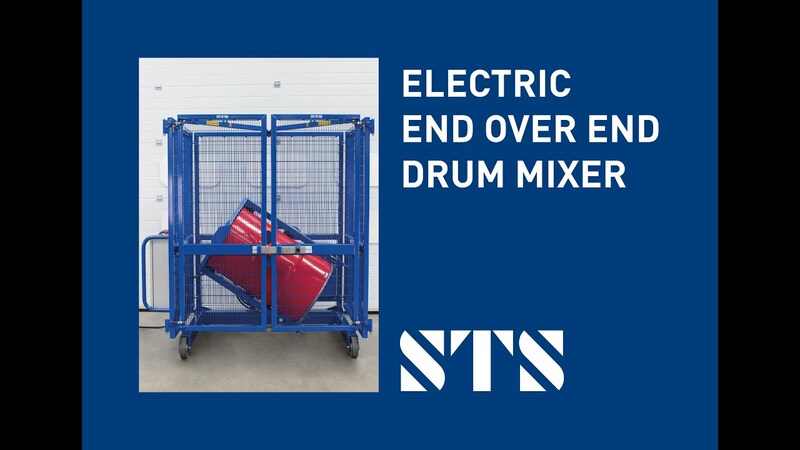 With our End-over-End Drum Mixer, you can mix 200- to 220-litre steel, plastic and fibreboard drums weighing up to 350kg. Suitable for liquids, powders and pellets, our high-quality drum tumbler is designed to handle long mixing cycles. Our pneumatic-powered drum tumbler uses an airline connection to power the rotation functions. The air source powers a pneumatic-hydraulic pump. The hydraulic pump powers a motor which in turn rotates a heavy-duty gearbox. The control system features start/stop buttons, an emergency stop and speed controls. If the airline is switched off or disconnected the tumbler will come to a stop. All of our STS drum lifters have been designed to easily load and unload the end-over-end drum tumbler. If you have a forklift drum attachment this can also be used providing it fits within the mixer cage. The base plate of the mixer head is 300mm from the ground and therefore it is important to ensure that any lifting equipment has sufficient lift height and is both safe and ergonomic to use. Drums of 200-220 litres in capacity can be secured into the drum tumbler head using the robust screw-top clamping bar arrangement. The clamping bar, which is adjustable, allows you to clamp drums of between 840-1010mm in height. Once a drum is secured, remove the t-bar (used to tighten the clamp), close the gates and begin mixing. To comply with the EU Machinery Directive our drum tumblers are manufactured with a complete guarding arrangement as standard. The guarding fully-surrounds the unit and prevents operators from accessing the machinery during mixing. Guarding is a mandatory requirement and is an important consideration when purchasing a new piece of machinery. Both the ATEX and non-ATEX end-over-end mixers feature safety gate interlocks: only once the gates have been closed can you activate the mixing function. To protect you and your operators, we've engineered an additional safety feature: should the gates be opened during a mix cycle, the unit will stop mixing immediately. The drum securing arrangement is suitable for steel, plastic and cardboard drums with heights from 840-1010mm. If your company handles drums not shown in our photos or videos get in touch and we can advise further on the compatibility with different drum types. Additionally, if you have any short/smaller drums we can offer a small drum adapter as mentioned below. We can provide a fully-adjustable insert to fit drums from 100-850mm in height. Operators set the adapter to different drum heights by moving the placement of two quick-release pins up and down. If you require a custom mixer for particular or unusual drums, we can explore the viability of making a bespoke model. Hazardous or potentially explosive atmospheres require operators to use zoned ATEX equipment. 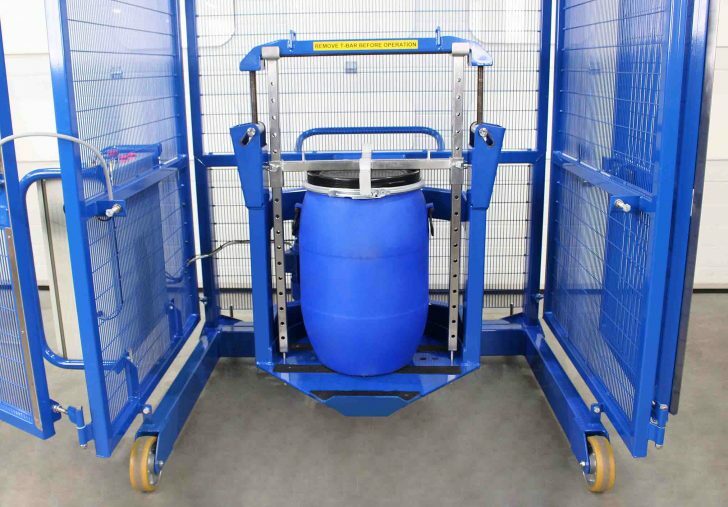 Having assisted numerous sectors which handle drums of flammable material, we understand different requirements and can offer an ATEX drum tumbler to suit. Our pneumatic-hydraulic drum tumblers can be supplied ATEX-compliant, suitable for use in Zone 1, 2, 21 and 22 environments. Each of our 'Ex' tumblers are manufactured to ensure electrical continuity, a path to ground is always present. Each piece of equipment is supplied with a manufacturer’s EU Declaration of Conformity which states compliance with the ATEX Directive 2014/34/EU along with a range of British Standards. We can provide this unit certified to ATEX Directive 2014/34/EU – suitable for use in ATEX Zone 1, 2, 21 and 22 environments. We can offer this model in 304-grade stainless steel. The drum tumbler can be manufactured for clean rooms as well as good manufacturing practice (GMP) areas. Operators can mix drums from 100-850mm in height with this tool. Adjust the adapter frame for smaller drums by moving the cross bar up and down the vertical support arms.